The half back is a BIGGGGGGGGGGGGGG JOKE its not half back its 33% of the sticker price i did the math on it and they were shock that i busted them on it. The sticker price is marked up when they started this bulls-it ad. Steinhafels and Colder’s, Pottery Barn and Crate and Barrel are all… over– very over priced on chairs.Here is some advice if you are chair-occasional, wingback, dining room table- shopping.Go to the internet first. Go to Amazon.com or Overstock.com and browse their chair selections. Print out the picture of your chair. Then compare with the big box stores–the exact chairs right down to color fabric and design are online at a fraction of the cost-no $70 shipping cost -most of the time the big O is $2.95 or free. I am a very happy online chair shopper-FEDEX to my door fully put together (Becca creme linen chair). 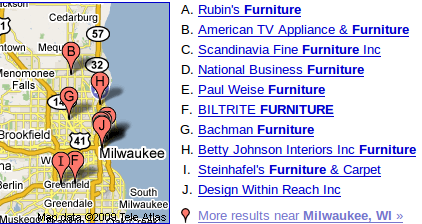 I am happy to share information about furniture shopping-comparison pricing. Also take your cellphone and get pics of the furniture store finds to see if you can find a better deal online worked for me!! @LindaCotter: Thanks for the tips! We actually did quite well on the dollar for dollar. We purchased a very nice quality bedroom set for a very good price (even at full price). We couldn’t find anything else we wanted, so the sales person figured out a way for us to purchase 3 pieces and we got the other pieces free. I did my research before hand on bedroom sets. They also have a wood guarantee, which for a reasonable price, for the lifetime of the furniture they come out and refurbish the wood. I like that because night stands and tables get ruined often with liquids and heat. @Rachel: It all sounds very nice. Familiar, even. Hopefully you’ll avoid various after-the-sale problems others have had despite initial satisfaction as well. Good luck.